Mavis Staples’ last album, 2016’s sunny-sided ‘Livin’ On A High Note’, was precision-tooled to raise a smile after a career, Staples noted, of “making people cry for so long” with humble tales from the front line of the civil rights movement, poignant gospel songs, and moving clarion calls to social action. Turns out, however, that that wilful joy was a short-lived phase: ‘If All I Was Was Black’ finds Staples at her most insightful (and most inciteful) in years, channeling the hectoring ardour of Martin Luther King (with whom she shared stages), the rabble-rousing agit-funk of Curtis Mayfield (with whom she duetted) and the keen observations of Bob Dylan (whose hand in marriage she famously rejected) to make an album that reflects on, agitates against and mourns for the state of Trump’s America in 2017. 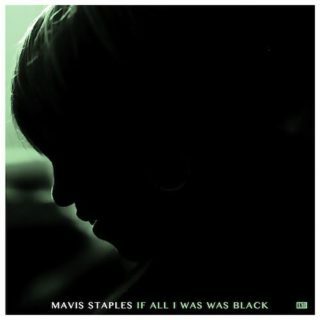 Thankfully, however, this being Mavis Staples, these lamentations have soul to spare, meaning that even at her most sorrowful, Staples’ rasping vocals and knack for phrasing and bandleading make these tough themes a joy to absorb. Accordingly, opener ‘Little Bit’ hints at racist police brutality with a grizzly strut, ‘Who Told You That’’s taut finger-jabbing riff brings a three-dimensionality to Staples’ attack on perjurious politicians, and the rattling electric guitar that cuts across ‘No Time For Crying’ builds a delicious tension as ever more backing singers join Staples in the insistent “we got work to do!” refrain. Rarely for an album this righteous, too, Staples displays an admirable humility in the face of her enemies: ‘Build A Bridge’ directly addresses the Black Lives Matter movement, but is seemingly sung to, and with empathy for, white middle America. Equally, ‘We Go High’, with its almost hymnal interpretation of Michelle Obama’s now-iconic speech, initially appears to be an ode to the moral high ground, but Staples frames the song with acknowledgement that her adversaries are “still human, and they need my love”. For an album this viscerally angry at the world’s injustice, such compassion feels almost saintly. Indeed, for all the grim social realities on ‘If All I Was Was Black’, the overriding emotion of the album is one of grace and love, which expresses itself nowhere more convincingly than on the upbeat, light-hearted jangle of the title track, the sort of dusty old sunshine pop that the Avalanches tend to dig out of second-hand crates and turn into summery Sunday afternoons: after making gently poetic points about race relations in the verse, Staples croons, “I’ve got love”, and the warmth generated by those three words overflow the song with such heartfelt power that there’s a feeling it could almost thaw the heart of Trump himself. Of course, it’ll take more than an album of vintage soul to unfuck the world in 2017, but for the duration of ‘If All I Was Was Black’, Staples gives the impression that here’s as good a place to start as any. It might not be as cheery as her last, but as Staples approaches her eighth decade as a performer, it confirms that she can still find stoic, neighbourly and kindhearted positivity in even the darkest of scenes.